For those of us who have been to social gatherings, a meeting functions in almost the same way. There is however a huge difference, business meetings are usually held to further the cause of a company or corporation. This ultimately means that this is not the time for fun and idle chit-chat. If you are in charge of arranging business meetings, you know how easily they can bog down or drag out, without productive outcomes. To get the most from a scheduled meeting, utilize the following tips to demonstrate executive business intelligence organizational skills. 1. Use a standard agenda. Circulating the same agenda format before every meeting will help participants to locate specific topic items. Request agenda topics at least two days before the meeting so the agenda can be finalized for early distribution, giving participants a chance to prepare. Having a standard agenda will help members “keep their eye on the ball” and not lose focus on what needs to be discussed and taken cared of. 2. Prioritize agenda items. 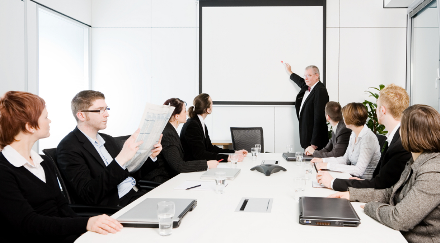 Often, a meeting will not be able to address every topic on the agenda. When preparing the agenda, select and prioritize items that can be fully addressed during the course of the meeting. Typically, meetings run from sixty to ninety minutes, or occasionally, two hours. You may even want to establish a set amount of time for each item, such as one or two minutes for the call to order and approval of agenda, and then estimate time segments for each order of business. Some may require five minutes, and others, fifteen to twenty minutes. If discussion carries beyond the allotted time, remind the group that other items may not get addressed if time runs out. Consider using uneven times, which can be eye-catching and encourage closer tracking. For example, instead of allocating ten minutes to a topic, give it eight minutes, and so on. 3. Open the meeting promptly with an ice breaker. The onset of your meeting can very well decide the interest of your member’s willingness to participate. Cite an inspiring quote from a famous person, a riddle related to the meeting topic, or a five-minute game relevant to proposed objectives. For example, if an objective is to narrow down a pool of candidates from twenty to five, ask attendees to rank-order the top five U.S. presidents they would put on the list, and why. 4. Serve light refreshments. Funny as it may seem, food is a proven draw to professional meetings. People enjoy something light to munch on or drink during a long meeting. Mention on the pre-sent agenda that coffee and muffins or fresh fruit and tea will be served, and chances are all invitees will attend. 5. End with an action plan. Everyone can volunteer or be assigned a follow-up task to work towards group initiatives and goals. Add follow-up reports to the next meeting’s agenda. Business meetings and events take time away from regular work activities, so their purpose should be meaningful and productive. Organize your next meeting with these tips and get great results.